In my lifetime, we have gone through what amounts to a revolution, but in an area most people have never heard of – manufacturing quality control. In the original system, production workers did their own thing while inspectors at the end tested the products and set aside faulty items for repair or "remediation". This was changed to a regime where "quality" was built into the product throughout the manufacturing process. Faults were detected and eliminated during production so that each item came off the assembly line in perfect working order, "right first time". Clearly, though, this concept hasn't reached the higher levels of politics. It seems our MPs can churn out the most unmitigated rubbish, with not the slightest concession to quality. And, if one is unwise enough to suggest that the product is somewhat less than of sterling quality, there will always be those who will suggest that we pitch in to help improve it, in the manner of old-fashioned quality inspectors. It seems that there is no expectation that, with all their resources, MPs should get it right first time. A classic example of this dynamic comes from Lucy Powell, Labour MP for Manchester Central and co-sponsor of the "Norway-style" plan currently masquerading as a solution to Brexit under the title "Common Market 2.0" (CM 2.0). In the beginning, of course, there was the Norway option, published in 2013 by the Bruges Group, which was then improved upon to emerge a year later in Flexcit as the Efta/EEA option. Yet neither of these versions, it appears, found merit with those of our MPs who thought to pursue the Norway option in their own names. First Stephen Kinnock and then Nick Boles just had to reinvent the wheel and, on the basis of limited study and even less comprehension, came up with their own versions. Having made a total mess of his first version, Nick Boles sought to come up with a revised plan, managing to make it even worse than the first, with the addition of a customs union. This was a wholly unnecessary adjunct as the EEA Agreement already makes provision for tariff-free trading between members, without the encumbrance of a common external tariff. Nevertheless, despite the obvious problem of not being able to join Efta if we are in a customs union with the EU, Kinnock and Boles have persevered with this bastardised version, joined by the egregious Lucy Powell, who has recently been parading the merits of a revised version which, if things go well for the triumvirate, will become one of the options put to the House of Commons in the so-called "indicative votes" expected tomorrow (Wednesday). Apparently concerned at the unfavourable construction put on tying in the customs union to CM 2.0, however, Lucy Powell popped up earlier this month to reassure BBC Today journalist Nick Robinson that the new version of CM 2.0 "does NOT propose a customs 'union' but Singke (sic) Market membership and a customs arrangement". This is an interesting claim as we see from the text of CM 2.0 that the "customs arrangement" to which Powell refers, "will involve applying the existing common external tariff". And that, precisely, is the WTO definition of a customs union. This is a rose by any other name. Now, here is a dilemma. On the basis of her education, one could judge that Lucy Powell is not an unintelligent woman, having read Chemistry at Somerville College, Oxford and King's College London, gaining a BSc at the end of her studies. Furthermore, having worked as campaign director for the pro-EU campaigning organisation, Britain in Europe, one might suppose she was better informed than average about the EU and its workings. With that, it is hardly credible to assert that Powell could not know that a customs union was a free trade agreement with a common external tariff, without also asserting that she is extraordinarily ignorant or so stupid that she does not understand what she is saying. But it does not stop there. In common with her fellow enthusiasts for CM 2.0, she believes that her "single market plus a customs arrangement" not only negates the need for the backstop, but has the "added advantage of being an off-the-shelf, quick model". At this stage of the game, where there is so much known about the nature of the Efta/EEA option, two things are certain. Firstly, because the EEA is an adaptive framework, specifically attuned to each Efta State, it is not an off-the-shelf model. Secondly, given its complexity and the need for multiple bilateral agreements to augment it, the option cannot be a "quick model". Self-evidently, it would seem, Powell is ignorant about the EEA. But what sort of person goes into the fray on such a high-profile issue without first making sure that they are fully and properly informed? Is this someone going out of their way actively to deceive, or is it someone so stupid that they are incapable of informing themselves? In my considered view, anyone who goes into the political fight without fully preparing themselves with the best possible information is exhibiting the height of stupidity. Others may care to label it differently but, base motivations aside, what better description is there? As for further developments, if we see "CM 2.0" on Wednesday specifically set aside for MPs to vote on, we will see a number – perhaps several hundred MPs – plumping for an option that is not in the least workable, based as it is on a series of demonstrably flawed premises. Given the choice, do we brand these MPs ignorant, or stupid? And at what stage does the perpetuation of ignorance become, in itself, stupidity? As to our response to these people, there are those who would have us treat them gently. Like Michael Portillo, they don't like my "tone" and want me to expend time and energy educating our errant MPs, in the hope that they will mend their ways, rather than "insulting" them. It has long been my personal experience that MPs follow along the general dictum that you can lead a horse to water but you cannot make it drink. Offering unsolicited information to MPs is rarely successful – for it to stick, they must first ask to be informed, and be prepared to study what they are given. Even then, we have the experience of Owen Paterson to guide us – a man with whom I worked closely for ten years, helping him with his speeches and keeping him briefed on EU-related matters. And yet, here is a man who has rejected almost everything he has been told, to adopt one of the most extreme "ultra" positions imaginable. To convey information is not necessarily going to have any impact. But, if we are having no impact, and no one is listening, one might ask what is the point of writing a blog. Yet that is precisely the question we could ask of every journalist and broadcaster, as we have a situation where the prime minister and her immediate advisors have long since ceased listening to anyone. We are all on the same footing. Talking this over with Booker, he has long been of the view that we have no role in speaking the truth to power, as such. It is pointless even trying when they are no longer listening – or even capable of understanding what we say. Rather, we are writing the epitaph of a failed system for those who come after us. And that requires candour, not diplomacy. Certainly, it is not possible to make any sense of what is coming out of Westminster at the moment, from any level – prime minister downwards. Someone on Newsnight even described parliament as a "madhouse". 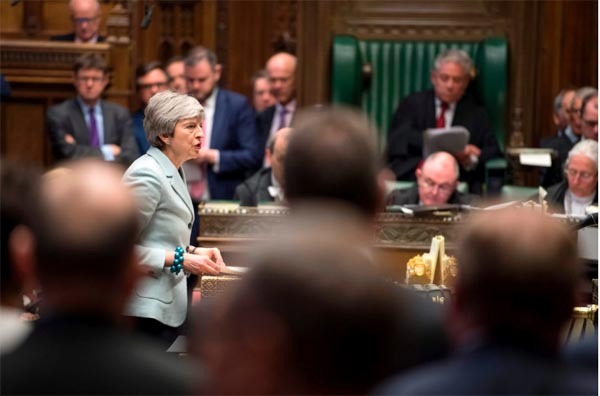 Yesterday, for instance, we had the bizarre experience of listening to Mrs May tell us that, "unless this House agrees to it, no-deal will not happen", despite this self-same Mrs May previously telling us that no-deal is the default position. In the same breath, we heard her tell us that "no Brexit must not happen" and "a slow Brexit that extends Article 50 beyond 22 May, [and] forces the British people to take part in European elections, and gives up control of any of our borders, laws, money or trade, is not a Brexit that will bring the British people together". On the one hand, the only way a "no Brexit" can occur is if she allows it. In the absence of her deal being ratified, the most likely outcome seems to be that we will leave the EU on 12 April. That much is very much the view of the European Commission. Since Mrs May is now saying that she will not even put the deal to another vote – as there is insufficient support for it - the only way that the Article 50 period can be extended beyond 12 April is for the UK to "indicate a way forward before this date for consideration by the European Council". That means we are really in trouble. The CM 2.0 charade indicates that, even after all this time, MPs are not capable of coming up with a realistic exit plan. Even while they have supposedly seized control of Brexit, they will fail to agree amongst themselves as to alternative courses of action. And whether this is a manifestation of stupidity may be a matter for debate, there can be no dispute that it represents a failure on the part of the political system. Whatever else one might say, we were entitled to expect that our politicians deliver a rational and effective Brexit. And whether or not you think them stupid now, it would certainly be stupid of them to think that, after their failure, there can be business as usual.